Your work was featured in our Inspirations Volume Eight. Le gros dodo! *gratouille la bedaine* Il a tellement l'air bien! I adore and envy the way your ferrets sleep! I'd love to sleep this way too! Warm ferret bodies Are he and Doodle going better along? So so cute. 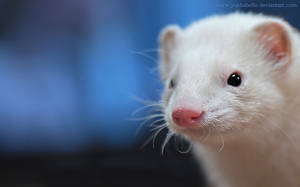 I love your pictures of the ferrets. If I lived near you I would have you do pictures of my fur babies. Very true. If I had the money I would come there.